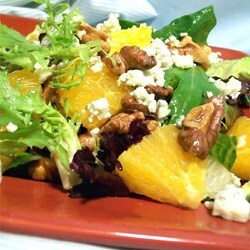 This Mandarin Orange Salad is a really delicious with baby wild greens, Mandarin oranges and sugared walnuts. 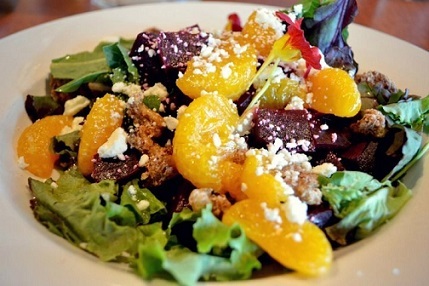 The sugared walnuts that garnish this salad recipe can also be served as a snack. The restaurant guests love this salad in the summer as it is very refreshing and flavorful, but I also enjoy it in the winter because it is festive enough for entertaining and simple enough for easy dining. This salad seems to appeal to all ages and is a great way to incorporate some fruit and nuts into diets. Prepare the sugared walnuts the day before you plan to make this salad and store them at room temperature. You can also purchase sugared walnuts at a grocery store if you prefer. 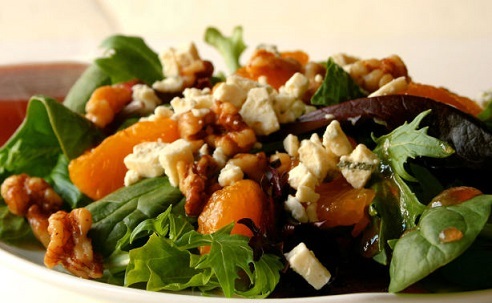 Enjoy your Mandarin Salad Recipe and the company of those you share it with! Did you know? The mandarin orange is also known as the mandarine. Reddish-orange mandarins are sometimes marketed as tangerines. Mandarin oranges are traditional symbols of abundance and good fortune and are often a Christmas tradition in Canada, the United States and Russia.